Your ophthalmologist may refer to this disease as the “silent thief of sight” because there are usually no early symptoms. In the most common type of glaucoma, there is no pain and visual loss is gradual, and generally unrecognizable in the early stages. Another, less common type of glaucoma can be associated with symptoms of head pain, nausea, hazy vision, and vomiting. Learn more about the different Types of Glaucoma and the Symptoms of Glaucoma. Variables that may put you at a higher risk for glaucoma are: People 60 years or older, African Americans, and a family history of the disease. 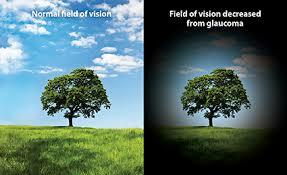 The best way to rule out glaucoma, and other eye diseases is to have regular dilated eye exams. Learn more about the Glaucoma Risks. There is no cure for glaucoma, but with proper treatment (prescription eye drops or sometimes surgery) and regular eye exams a patient can lead a normal and productive life with little or no vision loss. Learn more about Glaucoma Surgery. Sara S. O.Connell, M.D. and Johann G. Ohly, M.D. specialize in glaucoma at the Kansas City Eye Clinic. If you have any specific questions regarding glaucoma or would like to make an appointment, please email us or call the Kansas City Eye Clinic 913.341.3100. You can learn more about Glaucoma at the following patient education websites. These should only be used as a reference and not as a method of diagnosis or treatment. Please consult a medical professional for an evaluation.